MINNEAPOLIS & REHOVOT, Israel--(BUSINESS WIRE)--Mar. 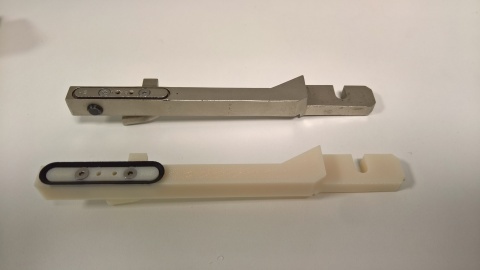 27, 2018-- Stratasys (NASDAQ: SSYS), a global leader in applied additive technology solutions, has announced that leading French pharmaceuticals company, UPSA, is reinvigorating its manufacturing workshop and enjoying cost reductions of as much 95 percent on some processes, since integrating Stratasys additive manufacturing. The impact on UPSA’s operations has been immediate and positive, with the investment paying for itself within just one year of arrival. The company, which is owned by Bristol-Myers Squibb, identified additive manufacturing as a means to revitalize its in-house workshop and attract the next generation of technicians. UPSA also sees the technology as the key to overcoming production-line challenges, which had previously limited the number of machine parts it was able to make via traditional manufacturing methods. This positive evaluation led to UPSA’s investment in a StratasysFortus 450mc™ Production 3D Printer, which proved an immediate success by quickly delivering substantial efficiency savings for the company not least in the area of critical parts replacement, which, as Dumora explains, was a key priority. “One machine in our manufacturing and packaging line is a heavy cast steel arm, used as part of the operation to grip and suction open a folding carton, so that blister packs can be inserted,” he explains. UPSA also uses its Fortus 450mc Production 3D Printer to build a device to improve the safety of the closure caps for its Efferalgan (paracetamol) for children, after some caps were received from the supplier with particles that could have inadvertently posed a risk of contamination to the medication. The device has proven so successful that UPSA has been able to discontinue the time-consuming and expensive visual inspections that were previously deployed. UPSA is also witnessing significant savings thanks to its deployment of Stratasys additive manufacturing for the production of camera mounts on the manufacturing line. “Needless to say, for those of us who use it, the Fortus 450mc is an absolute work-horse, but it’s immediate and positive impact is ultimately underscored by the fact that in the first year of integrating the machine, we more than made a return on our investment,” concludes Dumora. Stratasys is a global leader in applied additive technology solutions for industries including Aerospace, Automotive, Healthcare, Consumer Products and Education. For nearly 30 years, a deep and ongoing focus on customers’ business requirements has fueled purposeful innovations—1,200 granted and pending additive technology patents to date—that create new value across product lifecycle processes, from design prototypes to manufacturing tools and final production parts. The Stratasys 3D printing ecosystem of solutions and expertise—advanced materials; software with voxel level control; precise, repeatable and reliable FDM and PolyJet 3D printers; application-based expert services; on-demand parts and industry-defining partnerships—works to ensure seamless integration into each customer’s evolving workflow. Fulfilling the real-world potential of additive, Stratasys delivers breakthrough industry-specific applications that accelerate business processes, optimize value chains and drive business performance improvements for thousands of future-ready leaders around the world. Corporate Headquarters: Minneapolis, Minnesota and Rehovot, Israel. Online at: www.stratasys.com, http://blog.stratasys.com and LinkedIn. Stratasys, FDM, and Fortus are registered trademarks and FDM Nylon 12CF and the Stratasys signet are trademarks of Stratasys Ltd. and/or its subsidiaries or affiliates. All other trademarks are the property of their respective owners.